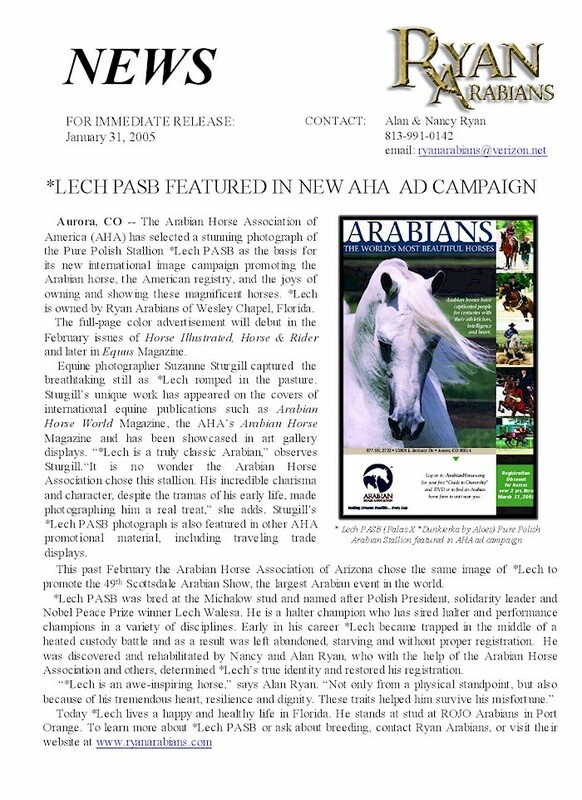 This year the Arabian Horse Association of Arizona, in search of “The most breathtaking image of an Arabian Horse” chose a recent portrait of Ryan Arabian’s own *Lech PASB. The skillful lens of Suzanne Sturgill captured this inspiring photo of the pure Polish Arabian stallion as he romped in the pasture. Sturgill is also credited with the creative graphic artwork in the print advertisement. The color full-page ad was featured in Cowboys & Indians Magazine, Horse Illustrated and America West Magazine. It also appeared on illuminated billboards in terminals throughout the Phoenix airport and in daily newspapers in Arizona. *Lech PASB was bred at the Michalow stud and named after Polish President, solidarity leader and Nobel Peace Prize winner Lech Walesa. By coincidence *Lech began his brief yet promising show career in Arizona, taking the Junior Colt Championship at the Southern Arizona All Arabian Charity show in Tucson his first time out as a 2-year-old. *Lech went on to sire dozens of foals before a complicated custody battle left him without proper registration. Injury and hard luck followed him for more than a decade, and chased him into starvation and eventually to the brink of death. By a strange twist of fate, *Lech PASB was discovered in Florida and taken in by Nancy and Alan Ryan of Wesley Chapel, Florida. Tough detective work and the passionate aid of leaders and experts in the Arabian Horse Industry helped determined *Lech’s true identity. Luck and incredible timing reunited him with his rightful name. Officials with the Scottsdale show selected the stunning Suzanne Sturgill image of *Lech because it aptly illustrates the incredible beauty, strength and stamina of the purebred Arabian horse. Last summer, a stallion named *LECH was wasting away in a Pasco County field. Now, thanks to a guardian angel, he is the picture of health and has resumed his place in a famous bloodline. 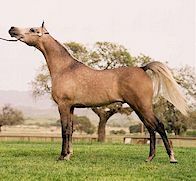 WESLEY CHAPEL - In 1985, a yearling Arabian horse named *LECH sold for $250,000, the top price at an auction held in Kentucky. By last summer, *LECH was anything but prized. Starving in a Pasco County field, the skinny gray stallion was so malnourished that every one of his ribs showed. His underbelly was shrunken. The tail that was supposed to be long and silky was coarse and matted. *LECH, who lived at a boarding barn, had been abandoned by a bill-skipping owner. Nearly 20 years ago, Arabian horses were trendy in America, coveted by celebrities. Singer Wayne Newton was the auction's master of ceremonies when *LECH was sold. Movie director Mike Nichols had been among the bidders. When the bottom later fell out of the Arabian horse market, it meant losses for investors. For the horses whose owners skimped on veterinary care, feed and boarding fees, it often meant worse. Unlucky *LECH - imported from Poland, where he had been bred at a famed Arabian horse farm and named for Polish Solidarity leader Lech Walesa - had trouble on top of misery. Not the least of which was that his registration papers were lost. 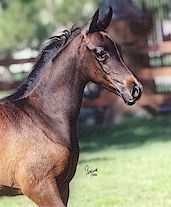 With papers, he was a purebred stallion who brought in top stud fees. Without them, he was 1,000 pounds of grey horseflesh. Nancy Ryan, an amateur horsewoman in Wesley Chapel, saw *LECH for the first time last summer. It was a chance encounter. She was tracking down some information about her new, pregnant mare, which led her to the place where *LECH lived. *LECH was cited as a landmark when she got directions to the stable. Ryan was told "when you see the skinny, grey horse, that's our place." "I just felt bad for him," Ryan said about the first time she saw *LECH. Ryan mentioned to the stable owner that *LECH looked like he was once a nice horse. She was told the sketchy story: imported, no papers, abandoned. A few months later, Ryan's phone rang late at night. It was the woman who boarded *LECH. "That horse you saw?" she said. "I can't afford to feed him. Do you know anyone who might want him?" The stable owner told Ryan that *LECH had a famous father, a Polish stallion named Palas. In a human analogy of famed bloodlines, it was like saying, "This is Caroline; her mother was Princess Grace." But Ryan didn't recognize the name. Still, she promised to make some calls to find *LECH a new home. He wasn't broken to ride and had a bad leg. *LECH would be hard to place. His plight nagged Ryan. She had been rescuing animals since her Connecticut childhood, taking in injured birds, adopting stray dogs. But she knew that taking in *LECH would be crazy. The Ryan household included three boys, four horses, an elderly father and two working spouses. Time was limited. So was money. "We decided to just go get him. ... We just felt bad for him," Ryan said. When the Ryan family pulled up to put *LECH into their horse trailer, everyone began to cry. "When I first saw him, I just said, "Oh, my gosh,' " recalled Ryan's 9-year-old son, Geoff. "I started crying. I thought, "How could anyone let a horse get like that?' "
Once home, they called veterinarian Jim Yanchunis. "He was a bag of bones," said Yanchunis, who has an office in Dade City. "It reminded you of a child in Africa who was starving to death. That's how bad he was." *LECH's teeth needed to be filed, an important part of routine horse care. Misaligned teeth prevent a horse from digesting food. *LECH's leg injury also needed attention. And where the sound of a healthy stallion can make bystanders cover their ears, he was barely able to manage a whinny. Yanchunis was familiar with neglected horses. Some people buy a horse, he said, not realizing that the animal requires dedicated and expensive care. They become irresponsible owners. The horse suffers. "But every once in a while, a horse's guardian angel will come along who's going to take up that mantle and the responsibility," said Yanchunis. At the Ryans' modest, open-air barn, *LECH's new feeding schedule included three meals a day of alfalfa hay, fortified horse pellets and flaxseed. He got daily doses of glucosamine, a supplement for joint pain. Underweight by 300 pounds, *LECH needed to gain at least 100 back to be on the road to recovery. "It took four weeks before I really felt that things were turning around," said Ryan. In the meantime, she became curious about *LECH's identity. Ryan, who works in public relations at University Community Hospital, is a former television news producer. She's good at digging for clues. "The only motivation I had was that it was a mystery for me," she said. "I love a good mystery." Her first calls included the Arabian Horse Registry of America. Its investigative team agreed to help. "If someone called up and just said, "I came across this grey horse. Could you tell us who it is?' we'd probably say no," said investigator Jim Benedict. But Ryan had a starting point, the possible names of *LECH's sire and dam (father and mother). Benedict was able to find papers. But he needed more. Arabians have permanent pink markings on their skin, which are as distinctive as a human fingerprint. The markings are included in registry information. To see if *LECH's matched, Ryan had to shave his forehead and leg. She sent pictures to the investigators. "He had been blood-typed as part of his registration requirements, so we had his blood type on record," said Benedict. "If we had problems with the markings, we could have asked her to draw a blood sample." But with the photographs, "we were very convinced that this was the right horse," he said. Ryan learned that *LECH had sired 30 sons and daughters during his first five years in the United States, after which records of offspring abruptly stopped. 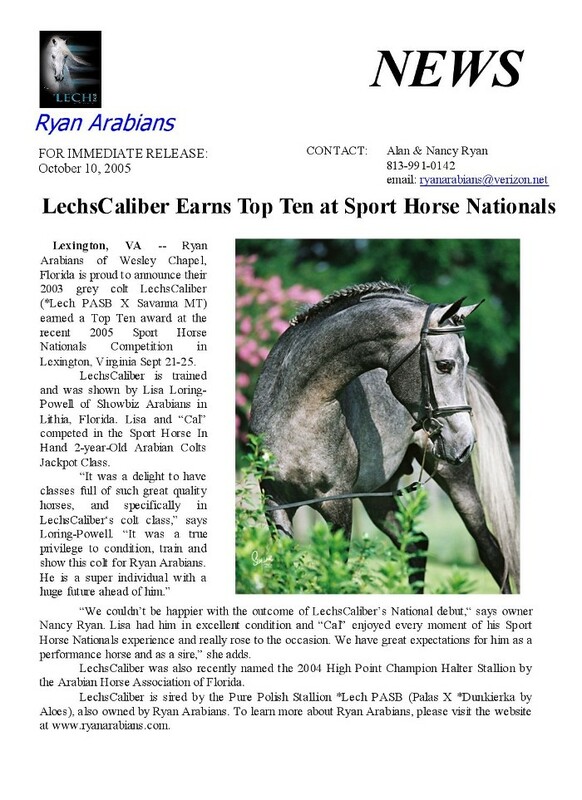 From the Arabian Horse Registry, Ryan found out who had imported *LECH. She tracked him down in Scottsdale, Arizona, where he owns an art gallery. "I left a message: "Are you looking for this horse? Do you want him?' I never heard from him," said Ryan. Staying persistent, she made more calls. One day, the owner picked up. They talked. He told Ryan his part of *LECH's story. He had an agreement to sell the horse and made a delivery to a buyer, but the deal wasn't completed because the price wasn't paid in full. The horse was never returned but was worthless without the papers that traced his bloodline. Ryan related the other part, the tragic part. "I told him I don't want to make money off this horse; I just want his name back," she said. "He said, "I don't care. Make all the money you want.' "
A new certificate of registration was issued on the basis of the owner's original documents. It outlines his lineage to 1921 and states his new recorded owner: Nancy C. Ryan. After more than a decade, *LECH was in limbo no more. In June, *LECH's story appeared in Arabian Horse World. Like the monthly fashion tome Vogue, the thick magazine for horse enthusiasts is full of leggy beauties. 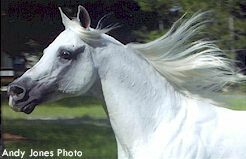 Its supermodels are the world's most stunning Arabians. "*LECH: Return of a Royal Son" attracted e-mails and telephone calls from people who had details about his mysterious life. Ryan learned about the auction where *LECH was sold. She received a photograph, taken when he was 4, and pictures of his offspring. But the period when *LECH fell on hard times still was unclear. Ryan doesn't know the succession of owners or what happened. She only knows he deserves better. A horse's life expectancy can reach into its 30s, said Yanchunis, and *LECH is 18. "In the time he was mistreated, he aged," said the veterinarian. "But he still has a lot of years left in him. "He's in very good health." The Ryans want a new home for *LECH. "We want this horse to have a good life. He's had kind of a rotten life until now," said Ryan's husband, Alan. "He needs to be in a place where he can contribute to his breed. We don't have the facilities or the time" to manage a top stallion. They have had some calls from people who want him, but the Ryans are wary because of fears that he might again be victimized. An editor at Arabian Horse World had another idea: Send him home to Poland. "I think that would be totally fitting," said magazine editor Mary Jane Parkinson. "He was imported in utero, so the Polish breeders haven't seen him. But we're hoping through some contacts to bring that about." 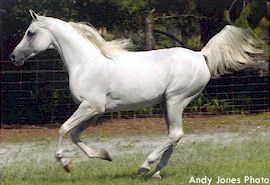 With a tradition of breeding Arabians that dates back centuries, Poland once produced the finest horses for European cavalries. *LECH was bred at the Michalow State Stud Farm in Poland, where in addition to getting meticulous care, horses roam through interconnecting paddocks. Noted for world-class champions, Michalow was formed after World War II, when its founder retrieved Polish Arabians stolen by the Germans. Ryan is hoping that *LECH's famed father is enough to win him favor in Poland. Meanwhile, in Wesley Chapel, *LECH likes to get carrots, sugar and gum massages. "He's a beautiful animal," said Alan Ryan. "We're attached to him." *LECH's rescue from abuse and return to breeding restore the dignity of a princely stallion. TAMPA - When we last left *LECH the stallion, his body had been freshly nourished to health but he was in need of a new place to call home. 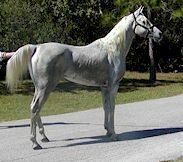 Readers may remember the tale of the white Arabian who sold for $250,000 in the 1980s, only to be found starving in a Pasco County field nearly two decades later. 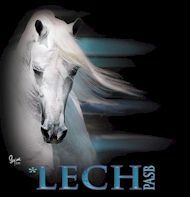 Imported from Poland, *LECH is the son of one of the world's most famous Arabians. When amateur breeder Nancy Ryan stumbled upon him at a Pasco boarding facility in 2001, he was just a badly neglected gray horse, abandoned by a bill-skipping owner. Those who read the story in July about his rescue and how Ryan uncovered *LECH's famous lineage responded with e-mails and phone calls from as far away as Kentucky. Ryan, who kept an e-mail message list of everyone who was interested in *LECH, announced to the group a few weeks ago that he has a new home. Last month, Ryan, along with her husband, Alan, and son Chris, loaded *LECH into a horse trailer for the drive across the state to Rojo Arabians. The horse farm in Port Orange near Daytona has a reputation as one of Florida's best. There, at age 19, *LECH will once again be a breeding stallion. "We really wanted him to be able to contribute to his breed," says Ryan, who is proud of *LECH's lineage. To make his potential offspring more valuable, the Ryans paid for DNA testing and other registration costs. 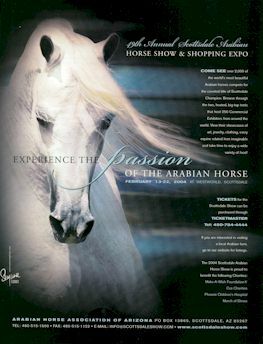 In a glossy advertisement in Arabian Horse World magazine, the horse whose ribs once protruded through his side because of starvation is being portrayed as a valued prince. Ryan also hopes that *LECH's stud fees can help other horses in desperate situations. She plans to donate $200 of every fee earned by *LECH to a horse rescue charity in California. Called True Innocents Equine Rescue, or T.I.E.R., the charity saves horses that are abused and neglected, then finds new owners. "It's unfortunate but that type of thing does happen. ... Horses are a total luxury for people, and they stop taking care of them," says John Brown, co-owner of Rojo Arabians, where *LECH lives. 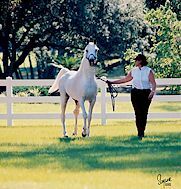 One of the country's top breeding farms, Rojo Arabians started as a hobby with two horses in 1982. It is the home of Versace, a well-known Arabian stallion who produces national and international champions. Ryan describes Rojo Arabians as "a fantastic farm where all the horses are treated like family." The stable is thrilled to have the stallion under its roof, Brown says. "That's a cool horse, and he's got this incredible pedigree," Brown says. *LECH's troubles began years ago when his registration papers were lost because of a bad business deal. In his early years, he produced 30 registered offspring, but then the paper trail abruptly stopped. Without documents, *LECH was worthless as a breeding stallion. But Ryan was determined to get back his name. The owner of the Pasco barn where he was boarded told her *LECH's father was a famous Polish stallion named Palas. Ryan enlisted investigators at the Arabian Horse Registry and was able to uncover *LECH's distinctive markings. The story the barn owner told turned out to be true. She eventually found his original owner, who lived in Arizona. He still held *LECH's registration papers and gave them to Ryan. Ryan had noticed during her research that the recording of offspring had stopped. That gave her a clue about when *LECH's exile began. But any day now, the time of his rescue also will be noted in birth records. His exile has ended. A new foal, fathered by *LECH, is expected soon at the Ryans' barn in Wesley Chapel. The birth will be recorded in the Arabian Horse Registry.